As I often do, I ended tonight’s class with a few gentle apanasana (perfect counter pose to an asymmetrical pose) and, as I often am, was tempted to warn the class that this is also called the ‘wind relieving pose’ and to just suggest that they don’t giggle too hard as the pose is named that for a very good reason. As usual though, I didn’t, and managed to behave. So here is a little bit more about this magical asana. A classic yoga posture, Knees-to-Chest Pose has many therapeutic benefits. 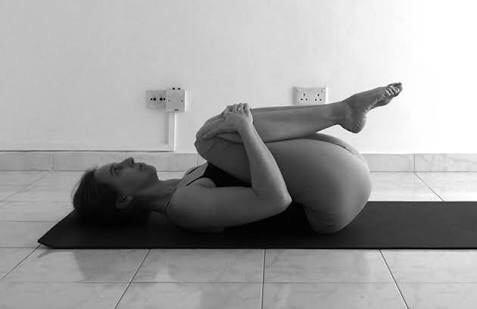 Because it’s performed on your back, it is sometimes referred to as “Supine Knees-to-Chest Pose.” Though the pose is rarely referred to by its Sanskrit name — Apanasana (ah-pahn-AHS-uh-nuh) — it can be helpful to understand its meaning. It comes from two Sanskrit words: “Apana” (meaning, “downward-flowing life force”) and “asana” (meaning, “pose”). In yoga, apana is a bodily energy that serves as the opposite function of “prana,” which is considered the vital life force. Prana gives life to the body through breathing and other techniques. Apana, in contrast, is the body’s force of elimination. It flows downward and out of the body, eliminating impurities through the lungs and excretory systems. Practicing Apanasana relieves the pressure of this force of elimination, helping the body to efficiently reduce and expel waste, toxins, and tension. The benefits of Apanasana are closely related to those of its variation, Wind-Relieving Pose (Pavanamuktasana): Relief from excess digestive air, indigestion, bloating, flatulence, acidity, and constipation. It is often recommended for those suffering from irritable bowel syndrome. In addition, this pose helps to keep your low back limber. It is often used as a soothing counter-pose to backbends and spinal twists. Because your body is compact in the pose, your thoughts are more easily drawn inward, which is useful for calming the mind and rebalancing your energy. With thanks to Yoga Outlet for the information.